Students attending a lecture. 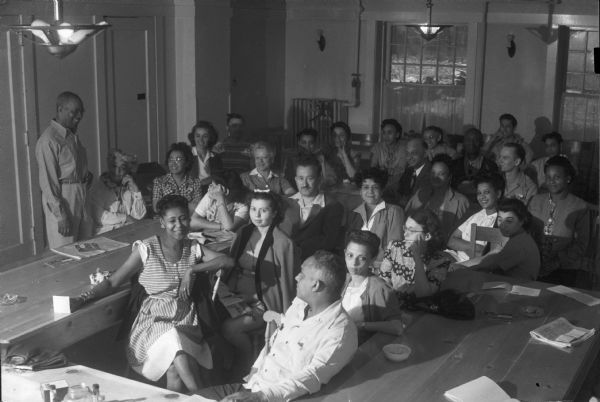 The Abraham Lincoln School for Social Science, Chicago, Illinois, sponsored a Summer Institute in Madison for several summers, including 1945. The students who attended the two week sessions were mostly adult union workers and their families. They lived in rooming houses on Langdon Street and Lake Lawn Place, attended lectures and participated in recreational activities. The photographs show the teachers with groups of students, both indoors and out-of-doors, the students participating in recreational activities such as boating and badminton and the children with a day care worker. The School was run by former University of Wisconsin Associate Professor of Classics Alban D. Winspear. Their textbook was called "Why Work for Nothing" espousing Marx's theory of value. The school had a communist / leftist philosophy and was often confused with the University of Wisconsin's School for Workers. One of two images. See: "The Daily Worker", Sunday Edition, June 6, 1943 and articles in the "Wisconsin State Journal" June 22 - Aug. 8, 1945.